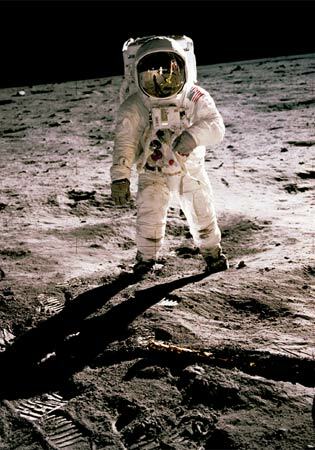 This image of Buzz Aldrin on the moon, photographed forty years ago by his Apollo 11 spacemate Neil Armstrong, has haunted me for decades. Not so much because it’s taken on the moon, as because of the image on his helmet, a mirror image that suggests there’s nothing behind the mask, inside that cavernous helmet, except for a kind of deadly infinite blackness, a void beyond which is nothing. (Except that we are there, whatever the ‘we’ are, and not necessarily just us humans.) It’s one of those images that seeped in and triggered the growth of the budding Buddho-Lacanian in me, the one who suspects that within and between the myriad things of beauty and color and sound and joy and sadness and struggle and sorrow and loss, there is some kind of space that’s dark and calm and empty, a place of infinite rest, the Buddhists’ calm abiding and the Slavic Christian’s vichnyi spokij, but a place that’s also somehow bottomless, one of Pascal’s infinite spaces, where planting a flag will hardly make a home. Where Elton John’s rocket man burns up his fuel alone, and Ground Control’s call to Major Tom gets lost, his circuit dead for good. As for Neil Armstrong’s walk itself, my memory of it is steeped in the hypnotic ambiance of the eerily blue screen and tinny sound of the black-and-white TV that filled up the summer cottage where we spent that part of the summer of ’69 with our extended Ukrainian family of siblings and cousins, aunts and uncles, against a background of crickets and rotting wood and septic tank smells. It’s all mixed together with the distinct memory I still carry around with me of walking down the country road outside that cottage with my dad and a friend of his talking about space and the future, the space between us and the moon filling up with the weirdly vertiginous understanding that someone was up there walking on that white orb, just as we were walking down here on this earth, in some sort of bizarre mirroring between earth and space. 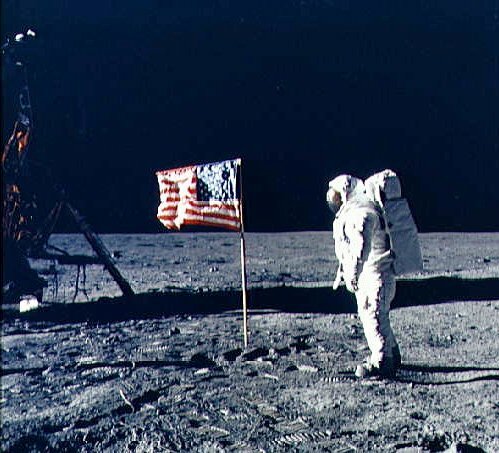 “We came in peace for all mankind”, they said, just as Jesus did, planting flags on a flagless, lifeless, inert, and in the end perhaps futile new world. If Apollo (alongside other missions) brought us the Earth as picture, a planet captured by technology, visualizable as an entity we (or our experts) can map, measure, quantify and manage — in all its boundaryless, post-nationalist glory (choose the interpretation you favor, the globalist or the planetarian), then the moonwalk — brought to us by Bill Bailey, Marcel Marceau, James Brown, David Bowie, Neil Armstrong, and most famously by Michael Jackson — gave us the Moon as dancefloor. 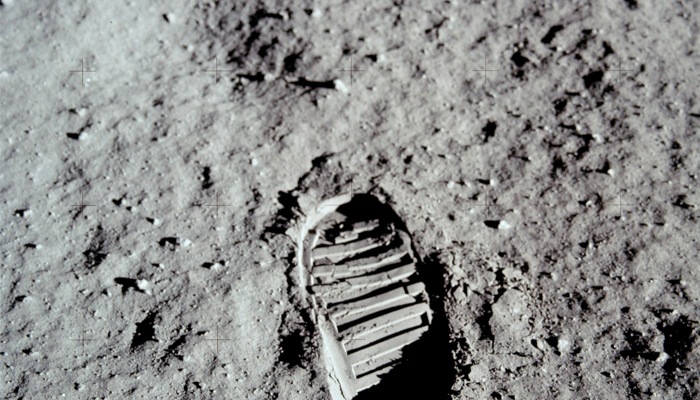 (Both Theory Vortex and Moving Images compare the two most famous moonwalks, Neil Armstrong’s and Jackson’s.) Sun Ra, George Clinton, and other Black musicians have, of course, been traveling to outer space for decades, as John Akomfrah argues in the film The Last Angel of History. Just as Ray Bradbury displaced the American frontier to our neighboring red planet in his Martian Chronicles, lyrically evoking the disappearing native culture in the face of the incoming settlers, African Americans, whisked off and carried forcefully to new worlds, have been mapping out alien space for centuries. Heidegger, it is worth noting, tells the interviewer in the Spiegel interview that the moon-landings scared him, and that ‘this is no longer the earth on which we exist’. Don’t forget The Police, “Walking on the Moon.” Also, a Native American friend once told me that her elder said it “was over” for humanity when we walked on the moon. To him it represented the ultimate stupidity of science to violate and sample the moon– something that was so sacred that it should be left alone. The need to probe it was an example of our scientific insanity. Are there any planned missions coming up? The part where you say that his helmet is like a void scared me most. I think for man to walk on the moon is a great achievement for science and it’s just humans curiosity about the things, may it be planets, matter or any thing that moves and persuades him to discover things and know things. And this I think is good, as long as nature and the balance of good is maintained..
And more missions are planned. I guess the next spacerace(if it happens) wil be between USA and P.R. China. didnt the russians just launch and go to the space station? @zeiterfassung that was a very interesting post thank you for sharing that. i would love to see a moon landing atleast once in my life time. If there is ever an achievement that we can always feel proud of as human beings are landing on the moon. Hopefully, this will open up new avenues of opportunity for us.